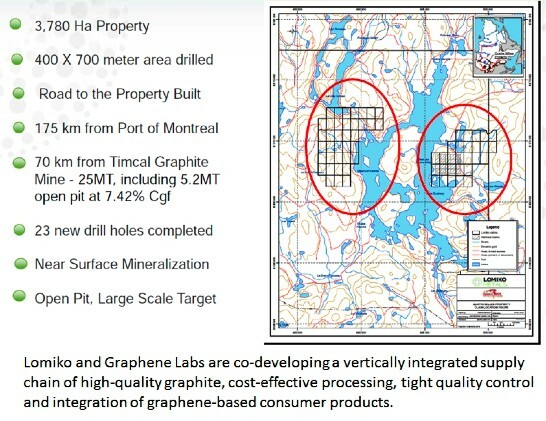 The collaboration between Lomiko Metals (LMR-TSX.V) and Graphene Labs is like a gold miner partnering with the world?s most innovative jeweler. On December 4, 2013 Lomiko and Graphene Labs took delivery of a prototype graphene supercapacitor built with proprietary technology developed at Graphene Labs. A report from Stony Brook University and New York State's Center for Advanced Sensor Technology stated that the specific capacitance of the prototype was an eye-popping 500 Farad per gram. The exceptional quality of the Reduced Graphene Oxide electrodes expands the operating voltage window, allowing the stored energy density of the supercapacitor to be increased. The prototype utilizes the highly conductive graphite converted to graphene produced from Lomiko?s Quatre Milles Graphite Project in Quebec ? thereby paving the way for future commercialization efforts. The properties of graphene, including its high conductivity, mechanical strength, and high specific surface area, make it an ideal electrode material for electrochemical devices used such as supercapacitors and next-generation Li-ion batteries. Graphene Laboratories specializes in the manufacture and sale of research materials to R&D markets. The company is working towards industrial-scale production of graphene and graphene-like materials, currently with pilot-scale production capabilities. Graphene Labs has spun out a new company Graphene 3D Laboratories, focusing on the development of high-performance graphene-enhanced materials for 3D Printing. 3D Printing is a billion dollar manufacturing technology that allows products with different components such as printed electronic circuits, sensors or batteries to be manufactured. A surgeon on a battlefield can now print himself a new scalpel. The technology is so radical that journalists who witness it often burst out laughing as though it were the world?s best party trick. High quality graphite is the base material for producing graphene. Lomiko is the exclusive provider of graphite to Graphene 3D Labs. "The graphite industry is a lot like the Canadian logging industry," explains Lomiko CEO Paul Gill in an exclusive interview with Tech Venture News, "Few players are interested in adding value along the production chain. We are conditioned to sending raw logs overseas. Lomiko has a valuable product coming out of the ground and we think we can add value by making strategic partnerships with private technology companies. With 9,000 graphene based patents pending, this is a big market which we are in a position to service." Graphene Labs? proprietary technology mixes graphene with polymers. It is inexpensive, scalable, applicable to 3D printable materials and other nanomaterials. Lomiko's Quatre Milles East Graphite Property is road accessible and is located approximately 175 km northwest of Montreal and 17 km due north of the village of Sainte-Veronique, Quebec. The property consists of 28 contiguous claims totaling approximately 1,600 hectares. The property was originally staked and explored by Graphicor in the summer of 1989 based on the results of a regional helicopter-borne EM survey. Graphicor?s historical drill program indicated a near-surface, road-accessible target. "Multiple drill holes with significant results bodes well for the concept of a near-surface, open pit scenario," stated Gill, "The impurities in the graphite add conductivity increasing their utility in the graphene technology space." 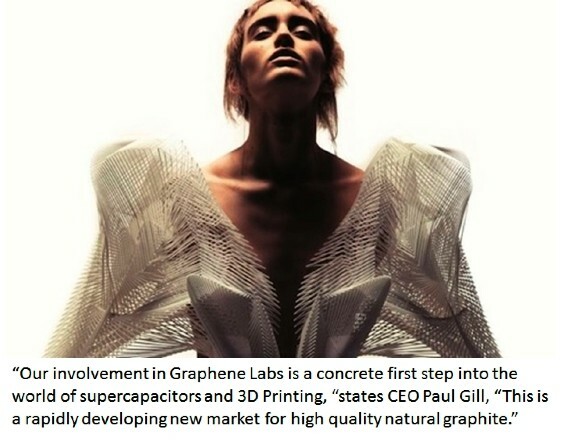 "We anticipate graphene-enabled materials to revolutionize 3D printing," states Dr. Elena Polyakova, CEO of Graphene Labs, "There will be strong demand from airspace, automotive, semi-conductor and advanced manufacturing industries." Lomiko currently owns 15% of Graphene Labs. It may increase that position pending the achievement of further technological milestones. "We are in the middle of a perfect storm,? states Gill, ?The Graphene technology space is exploding. And inside there is a potentially disruptive invention called 3-D printing. There is great synergy for us as a resource company and a downstream technology investor." Lomiko Metals is currently trading at .06 with a market cap of $4.9 million. 04/11 InvestmentPitch Media Invites Investors to the Global Chinese Financial Forum..
03/21 LOMIKO METALS : Completes drilling to expand la loutre high-grade refractory zon..
03/07 LOMIKO METALS : Completes 15 holes and adds six new drill hole locations to cove..
03/07 LOMIKO METALS : Completes 15 Drill Holes and Adds Six New Drill Hole Locations t..
03/04 Uptick Newswire Hosts Lomiko Metals, Inc. on the Stock Day Podcast to Discuss..